Pop oddities, indeed. This upstart label from the UK gathered eleven of the grooviest cats this side of chillwave for its inaugural compilation, and if it’s to be believed, there are fabulous things in our, the lucky listeners’, future. I’m nodding my head right now to Nomadic Firs’ entry, for one because it’s awesome, for two because I’m an unabashed Nomadic Firs fan, so duh, I’m coming back to that one. Ryan Boos is a genius. The talent here, otherwise, is fairly unknown to me, but I hope that doesn’t last for long. The artists are all bedroom/basement producers with an ear for gorgeous melody and a knack for layering it in Pro Tools – or whatever the program du jour is – and slapping a beat on it. Them There strings the tunes together like the mixtape it is, allowing the tracks on each side to flow into one another, highlighting the singular vision of the label. 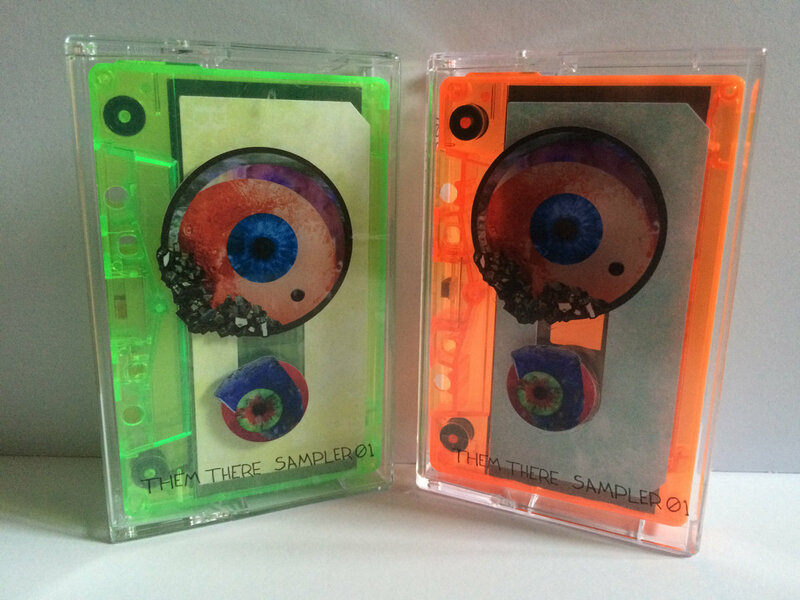 The packaging is top notch too – stickers adorn a clear Norelco case, no J-card, and the cassette comes in either fluorescent green or orange. (Mine’s orange.) If it was a Ring Pop, it would totally make sense, but it’s a tape, so I had to really restrain myself from trying to put it in my mouth. The clean, no-frills look allows the color to pop through like an acid trip, and the lysergic pop tones contained within wrap the whole thing up nicely. Bravo, you guys. Like I said, I haven’t heard much from these artists, but I’ve found some new favorites, and I can’t wait to hear what they come up with next: Tone of the Number Five, Tafu Gai, Crook, Outpost, and Bolts. And Nomadic Firs – don’t ever, ever change.